As part of the 1881 Army reforms a significant challenge was set the members of the Army Council who brought together the units that formed the Regiment. 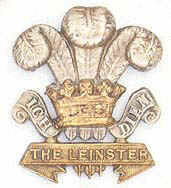 The 100th Foot became the 1st Battalion Prince of Wales Leinster Regiment (Royal Canadians) and the use of the 'Royal' in the title meant that it could not be paired or amalgamated with an Infantry Regiment with a lower number. The numbers 101 to 109 had been assigned to the former Regiments of the East India Company, so the choice was which one? Of the old East India Company Regiments there existed already a fierce loyalty toward each other, and the fact that the 109th was born of the 3rd Bombay European Regiment, which was itself born out of the 1st and 2nd Bombay, the 109th were hoping to link with the 103rd (Bombay) Fusiliers, itself born from the 1st Bombay Europeans. This appears to be so logical that it was never understood why it was refused outright and two Regiments with no connection became joined at the hip. However as many ex soldiers and other servicemen will know, it was only a matter of time before the two unfamiliar Regiments of 100 and 109 settled down as the 1st and 2nd Battalion of the Leinster Regiment, sure in the knowledge that each had its own unique history, and that now was time to forge history anew as battalions of the Prince of Wales Leinster Regiment (Royal Canadians). Regimental strength was nineteen officers, Forty-two Sergeants, forty-nine Corporals, fifteen Drummers and Four-hundred and fifty-six Privates.